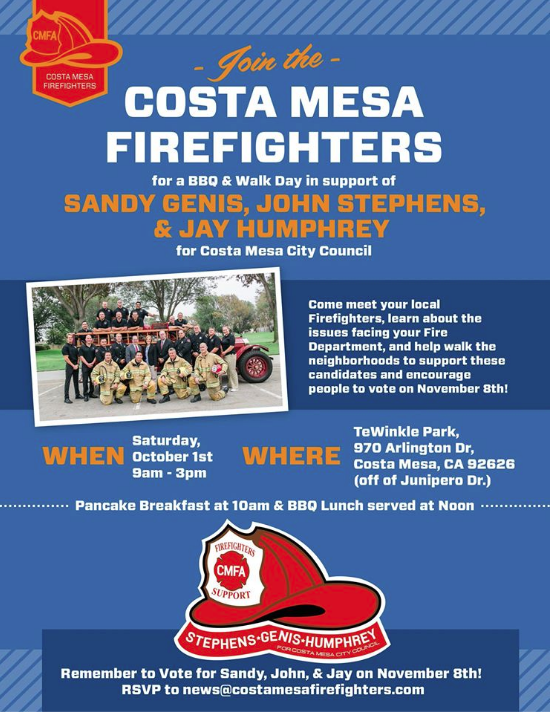 Just a little reminder that Costa Mesa Firefighters will be at TeWinkle Park this Saturday, October 1, 2016 from 9 a.m. - 3 p.m. in support of City Council Candidates Sandy Genis, John Stephens and Jay Humphrey. Good grub will be served. See the flyer below. Click on it to enlarge it. And so do the rest of us!!! Remember in November, just six weeks off. I don't know if Julie Mercurio could write anymore lies in her comments. Sadly after she posts all these lies she then attacks Genis as a liar. What a disgusting human being. Sadly she is an appointed city official. The other sad thing about the post below is both Tim Sesler and Jeff Arthur (members of the pension committee)also know her comments are a total lie and yet they are silent. Sesler did respond but instead of correcting the lies he attacks John Stephens, his committee member. Sesler is another disgusting human being. Below after my comments is the post the disgusting Julie Mercurio made. Almost every fact is a lie in her comment. The employees receieved a 15% increase. They went from 2@55 to 2.5@55. This means a 30 year employee under the first scenario gets 60% of their salary. Under the second it's 75%. So it's not the 25% Mercurio claims. Even sadder is the employees did agree to pay for it and in fact started partially paying a year before it even passed. They continue to pay the 3.52% it was estimated to cost to this day. Just a total lie it was an unpaid increase. One secret vote. Another huge lie. There were 3 public council meetings (the first was May 20, 2008) held over this increase. Simply another lie by Julie. The next year 102 employees retired again a total lie. There is power point slide showing 87 people retired from 2009 to 2011. I believe it's still on the city page. Keep in mind 54 of those 87 were given incentives to retire in a downsizing effort. So you see Julie just tells big lies one after the other. Lastly as the pension committe and Selser know the net liability didn't increase 16 million dollars that night. The unfunded went up 4 million. Just about everything in that post is a lie except maybe for her name. How disgusting for appointed commissioners to just post so many lies and have others turn a blinds eye MR. Selser when you know it's all a lie. Here is her post full of lies. Julie Mercurio The origin? One question of staff, how did we give a retroactive unpaid increase of 25%with one vote in secret? The next year 2009, 102 employees retired with an unpaid for pension enhancement. The net liability to the City increased 16 million dollars that night. One more lie I missed. The comment even the Mayor implies is about brought to you by bought and paid for candidates. Maybe elsewhere but that comment is not true in Costa Mesa. Our 3 most generous pension formulas were passed by such Council Members Allan Mansoor, Erik Bever and Gary Monahan. Monahan is the interesting one. The fire department 3@50 would never have passed had Gary not voted for it. He was the swing vote. You know what that means? According to Julie and the Mayor, Gary was bought and paid for. Monahan also voted for the police 3@50 back in 2000. That means he was really on the take. He is the only member to have voted for the 2 highest pension formulas. Back in 2008 the increase Julie was lying about, Mansoor and Bever not only voted to give that increase Bever even praised city employees for understanding the economics of it and agreeing to pay for it. I hope Julie Mercurio feels really good about her lies because my guess is as such a disgusting human being she will not lose any sleep over lying. Breadking bad - how about a letter to the Daily Pilot? I'm guessing the people who read this blog are already on your side. That information needs a wider audience, and they sure won't let it see the light of day on not-so-Public Square. I am going to be kind here, as this all came to me in a dream, and while talking in my sleep I was recorded on my security system. 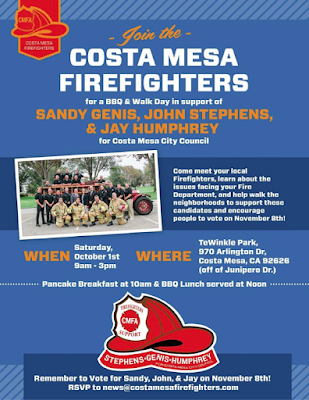 People need to pay attention to the positioning of Mercurio into the local politics of Costa Mesa. Mercurio/Weinheimer/Mercurio is nothing more than a shill to put forward the pathetic impulses of Righeimer and Mensinger. I'm sure that just because Mercurio and Rob Dickson are Corona Del Mar High School Class of 1986 alumni, there is no link to her appointment to the Parks & Rec Commission and their intimate knowledge of each other. Mercurio came crawling out of a dark cavern to get her hands on CMPS, and now she actually believes that she is something. Pay attention people, and do your homework. There is a lot going on in the background, and Mercurio's mercurial rise to the top of the dough pile, and withdrawal from running for a council seat, points to only one conclusion. I will let you decipher what that may be, although Mensinger's GPS data, will never be released to the public, unless it comes out during Impola's testimony, which would be something to see. But Impola will plead guilty, so it comes down to the civil trial. There was another PI on Mensinger that fateful night at Monahan's toilet bowl that no one knows about yet, and that bombshell will be something. Mensinger is not exactly the brightest bulb. Phew, what a dream that was. Don't worry about either of the Julies. Both of them have a reputation as liars and people have caught on. Their words do not resonate any longer as the truth. Not that it ever was. Sesler is an attorney that gives attorneys a bad name. An underachiever locked forever in his corporate cubicle because he can't get a job with real attorneys. So his bitterness pours out in terms of lies. Kind of like that of McCarthy. Bitter, nasty and hateful. I hope that once this election is over and the honest ones are in office, they will proceed to let go the cancer that is in our planning commission, Parks & Rec, and city admins. There is hope in November. WMC hit the nail on the head regarding the attorneys. Andranian. It's too bad he has shown clearly that he is cut from that same cloth - a yes man. All the commissions that have been stacked by the majority need to be cleansed and it is unfortunate more terms aren't up.